Snugtoes : Giveaway : Christmas Postman! Who's going to have the cosiest feet this Winter? Yeah, that'll be me! Hell, yes. I life in the West of Scotland and it’s November. The kids that live in my house are allergic to closing doors against drafts. Heated slippers therefore sounded like a brilliant idea! So when the package from Snugtoes arrived, I was very happy. The packaging was actually really smart. I was impressed, and I hadn’t even opened the slippers up. The instructions were on the packet. 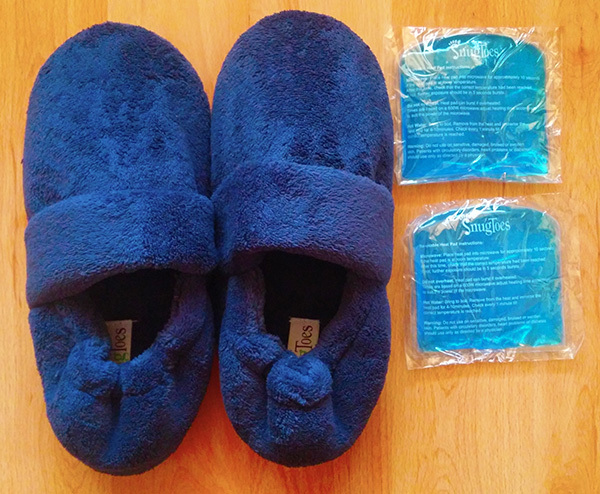 The magical, heat source for these slippers are little blue pads which tuck into the front of the slipper to heat your toes. 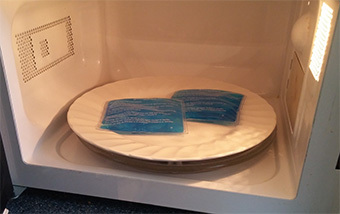 To heat them, pop them in the microwave (for 10 seconds, then additional 5 seconds bursts until the desired temperature is reached at 600-750W rating). Then tuck them in and your toes are toasty. The truth is, the first time I put them on, I made an involuntary “aaaah” noise. It was primal. Holy hot tamale, it was as comfortable as my feet have ever been! As you may be able to tell, they definitely get my vote of approval. Get these for anyone you love! Snugtoes sell male and female style slippers in small, medium and large sizes. They are £22 a pair, including heat pads. Spare pads are £3.50. One lucky person will have two lucky feet! 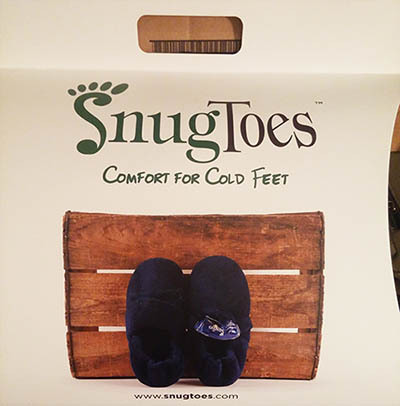 Snugtoes have offered us a pair of their amazing slippers for one lucky winner. Male / Female / Small, Medium or Large. Winner’s choice! Simply enter via the Gleam widget below by 30th November 2016 at midnight. 2. 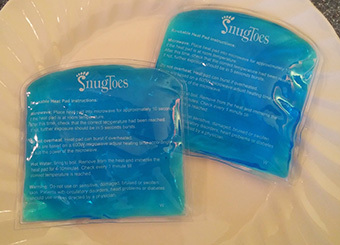 The prize is a pair of Snugtoes Heated Slippers! They stop me falling over! I think theae are brill it will keep my toes toasty. I love my toenails because I can paint them! These should stop the chilblanes! I can wiggle my little toe independently. I like my toe nails when they look pretty! The favourite thing about my feet is when they are covered up with socks, I hate my feet! Well my legs would look little underdressed without them ha! They love fluffy socks and cosy slippers ???? I gather my emojis don’t work on here (hence the question marks) sorry about that!! I am lucky that they aren’t too big or unsightly, even though I have worn some terribly bad shoes in my time. However, they do get cold. But, when my feet are warm, I’m warm. How it feels when I take my shoes off! they take me where i need to go! My feet look quite compact. No horrible toes or big bunions or anything! They’re handy for storing shoes! they are useful for standing and walking! They can be hidden with socks. Brilliant idea and love the way you could also use them as heat pads on other parts of the body. My toes when painted a bright colour. My favorite thing about my feet is the fact they do not smell!! My favourite thing about my feet is when I’m able to stand on them. This is limited time to disability but I am thankful if I can walk even 20 steps. These would make a huge difference to me as I have severe circulation problems. I have got feet? have not seen them for ages. I really must diet. But I just love how they feel with some comfy slippers on. That they are usually hidden away covered by socks and slippers. They are a nice size for my height. Please, I would love to try these. They’re the right shape lol!!! My favourite thing about my feet is that I have some! So grateful to have them and be physically well, I’m always on my feet at work so they come in very useful. I like the way they are not too big and not too small – just the right size in fact! Great question! I actually don’t like my feet very much because they hurt so much all of the time no matter what I do, much like my entire lower body. But actually, I have some really nice tattoos on both feet and these are probably the best thing about my feet now. Years ago I probably would have said the fact that they help me walk and that should probably still be my answer now, but I can’t walk very well any more, so it’s hard to be enthusiastic. Anyway, the slippers look nice! Thanks for the chance to win them, sorry for the waffley answer! I like how they’re the same size as my brother’s. I can borrow his shoes. I have an oriental dragon on the top of my right foot. It was 2.5 hours of agony but it was worth it. I love my dragon. My feet look spectacular in pair of heels because the tattoo really stands out. Socks that go on them! I hate my feet. They are way too big and quite ugly! I need some snugtoes to cover them up. My feet are a freaky talking point, apart from looking like they’ve gone several rounds with a stamping horse, I have a size and a half difference between them, no one believes how much difference it is until I get tipsy and show them! At least I have an excuse for not walking in a straight line and falling over..
That I can paint my toe nails…. not that much of a foot fan! My toes are not very pretty but I would love to wriggle my toes inside these slippers. My favourite thing about my feet…..they carry me around all day…! They made me a good footballer…. a few years ago! That they are at the end of my legs and get me from A to B when I need them too! I’ve never really given them much thought – they live out of sight and mind in socks! My toes as I love painting them. I hate feet, however my husband loves mine and most nights he rubs my feet for me. My feet are quite small (size 4) so I am able to buy children’s trainers ???? not sure I actually like my feet to look at but I do like them being massaged and my toenails painted. That I am able to cover them up! Nothing – I have a phobia about feet – can’t touch them at all. They’re small so I can fit into cheaper kids shoes! My feet are large and always cold as I have Reynolds despite of the circulation. Yet despite all this my feet still manage to look elegant in shape . My favourite thing about my feet is that they are quite narrow! That they’re slim and look great with my shoes! I find it fascinating that there are hundreds of bones in the feet which all do a great job. Stop me from stubbing my toe – ouch! I like my instep. It’s quite high although I still have yet to master walking in heels. That it never ceases to imagine me how far they can carry me! Nothing! They’re pretty useless as I’m a wheelchair user and can hardly stand, and they are always so painful. not alot. i do love socks though! They are small – size 3. They stop your legs from fraying. My feet are one of the only parts of my body that still do what they were designed for. Yay! I like my feet when I paint my nails. I’ve got festive coloured nails at the moment.